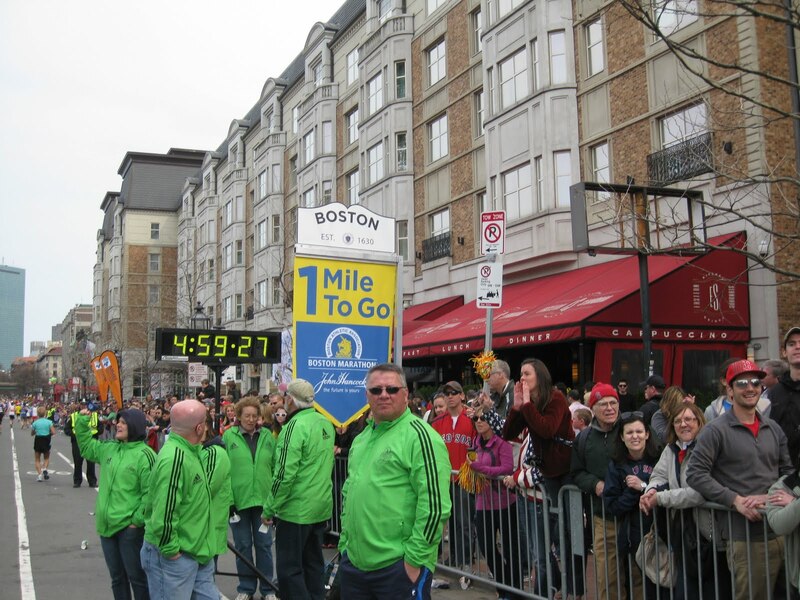 Xaarlin: Boston Marathon (aka) The most Awesome Weekend Evah! 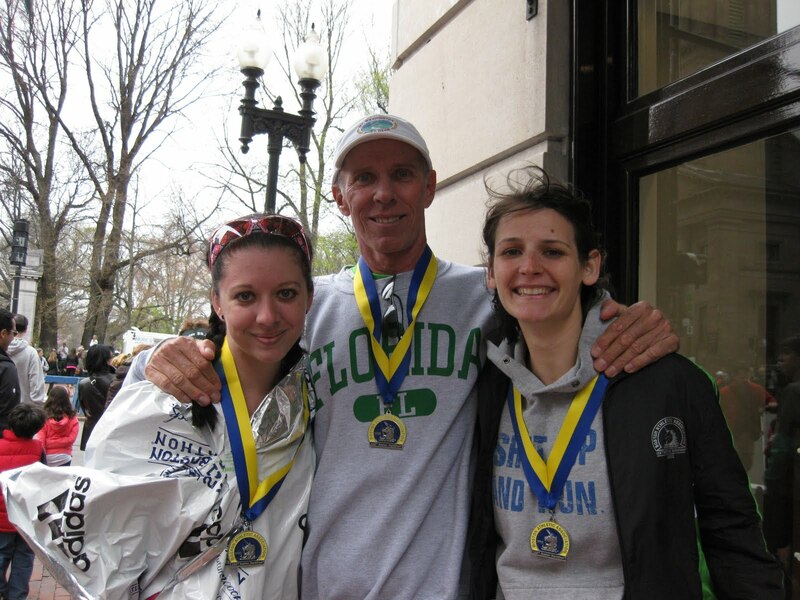 Boston Marathon (aka) The most Awesome Weekend Evah! 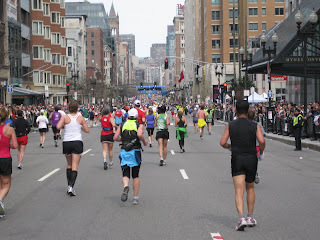 After 9 weeks of training I finished the Boston Marathon with a HUGE smile on my face. And then felt really bad- not puking bad- but like every muscle in my legs were cramping up/ light-headed like I might fall down kind of bad. Never felt so completely crappy after a race before. But you wouldnt have guessed that from the photo. Rewind to the beginning now. 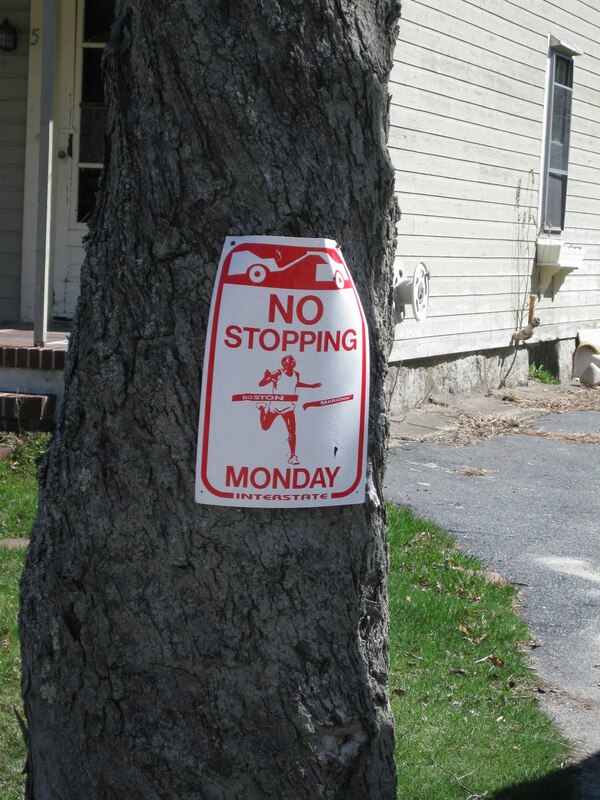 Waiting for the Bus to Hopkinton. 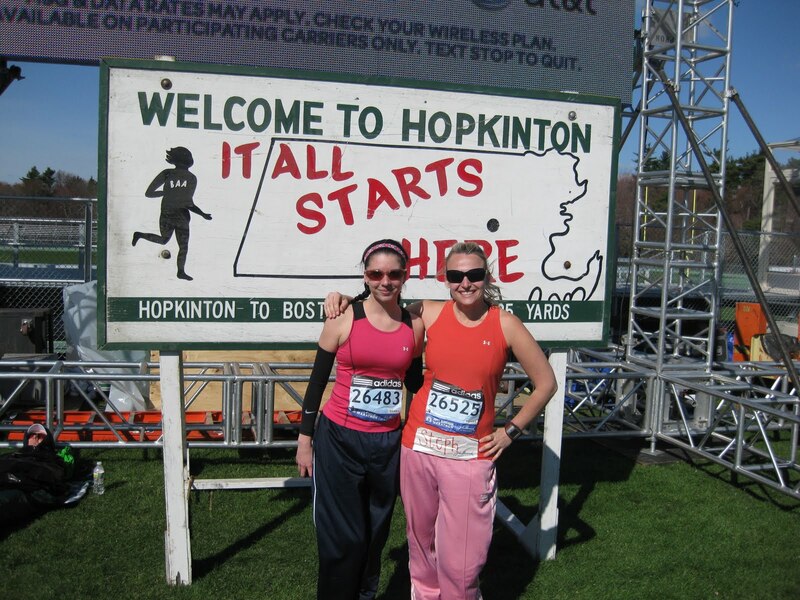 We met Stephanie , the other winner from SUAR's Boston contest and made our way to Hopkinton. It was really nice meeting her and I have to say a BIG congrats on her PR!! Stephanie and I at the Athlete's Village. 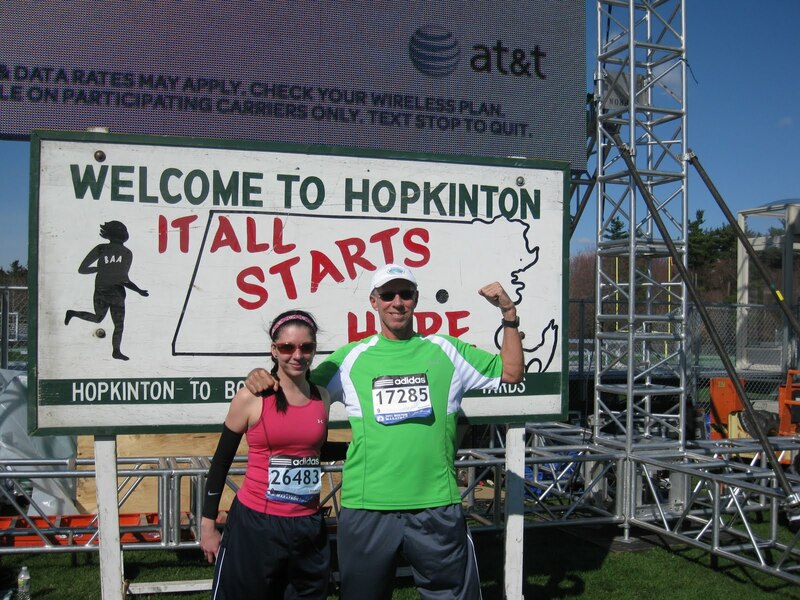 It all starts in Hopkinton. 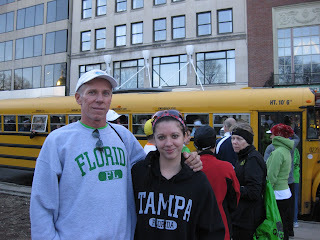 My dad and I were really excited to run Boston. I was feeling really good going into the race. 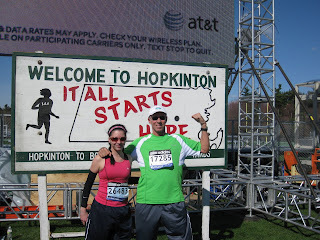 Even with the shortened training cycle, I felt confident with the 26.2 miles that were awaiting me. The first few miles were good- i was keeping close to my goal pace while weaving around loads of walkers. By mile 5 the course had opened up and it was easier to keep a good pace. Mile 6 was when I started breaking down psychologically. I could feel hotspots on my 2 big toes and that worried me a great deal. 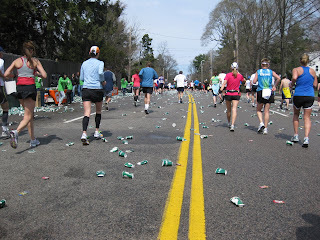 I remember thinking "oh crap- Im going to have 20.2 more miles of this." I wore the same shoes and socks I had used on my long runs and had never had a problem with blisters. I can only guess it was because of the downhills so early in the course. 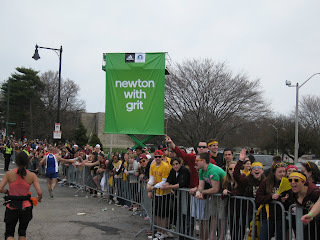 I really loved all of the signs like these along the course. 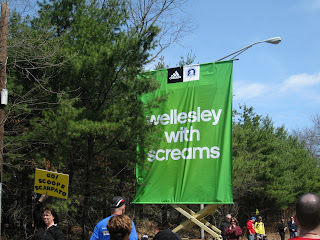 Wellesley was exactly what I thought it would be. Crazy screaming girls. It definitely gave me an adrenaline boost. 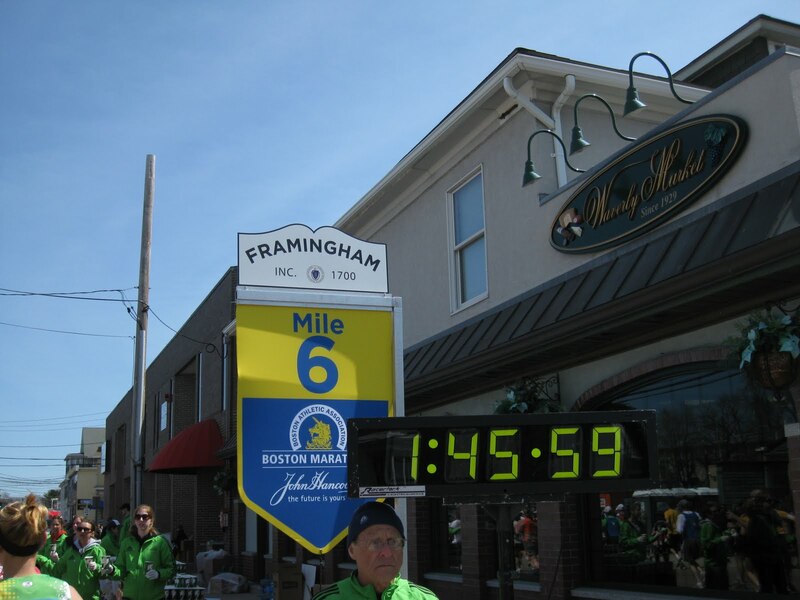 I was still on pace by the halfway mark hitting a 2:01, but was feeling worse and worse as the miles went by. Then I started to slow little by little. The Newton hills slowed me down more. The more my feet hit the pavement, the more I thought about the blisters. I started feeling sluggish and flat. Some days you go out and feel great, and others you dont feel good. 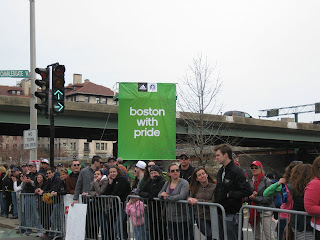 Boston was one of those not feeling good- cant get into the groove kind of days for me. It stinks even more because the weather was perfect. 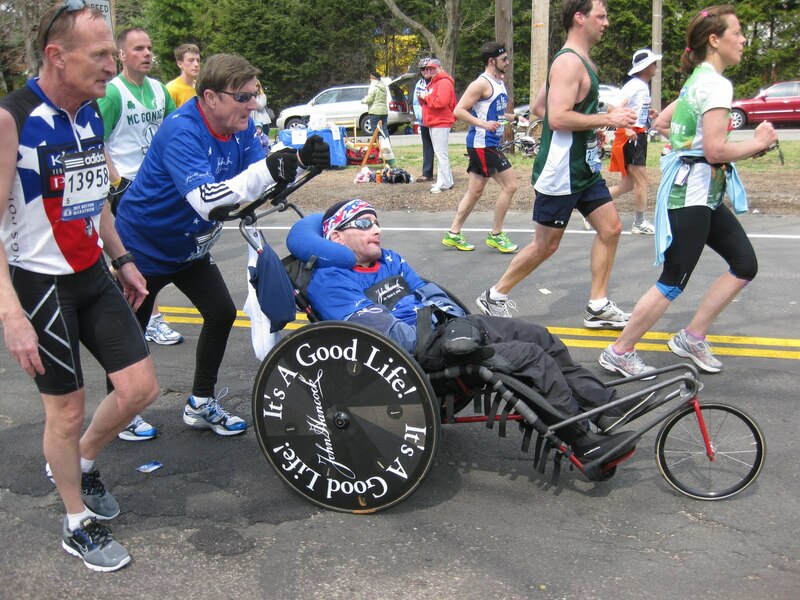 Somewhere around mile 18.5 I passed Team Hoyt. I started to tear up. Ive grown up watching their story on TV. I couldn't believe I was there alongside of them. What an inspiration! I was really happy the hills were over. They arent that steep, but with already tired legs, they become something a bit more fierce. 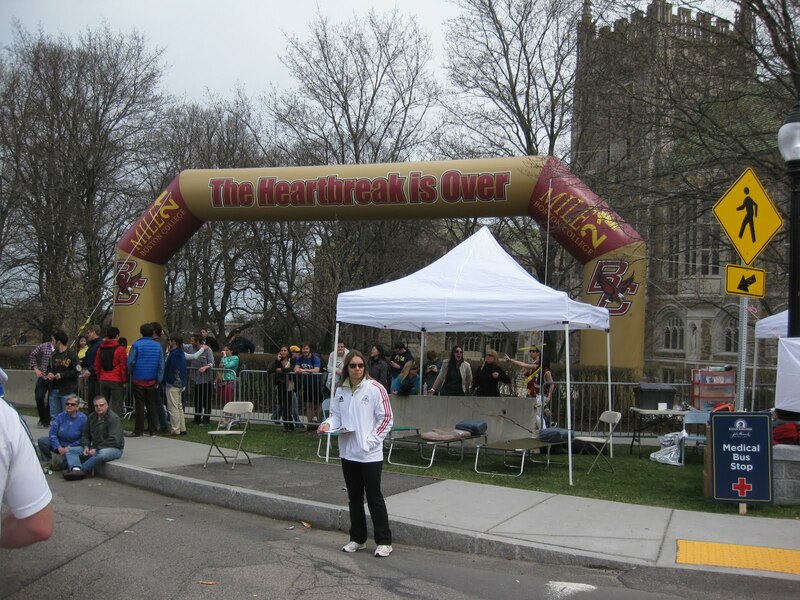 Running up to the crest of Heartbreak Hill, someone had written "Thump" "Thump" "Thump" about 20 ' apart going up the hill. It made me laugh and gave me some extra motivation to get to the top. It was a great feeling getting into Boston. The last 3 miles were the hardest for me. I said- "Legs, lets do this. It's only 3 miles. We should finish strong!" My legs replied with an emphatic "F%$K YOU!" as they gave me the finger. I picked up the pace a little and could not believe there was only one mile to go. 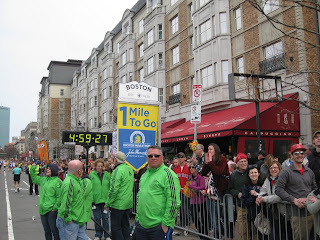 I hobbled as fast as I could and vowed I would not walk a step until I crossed the sacred blue and yellow finish line. There it is in the distance. 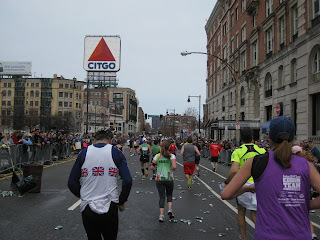 Just a few more blocks and I would be a Boston Finisher! I picked up the pace, tried to fight back tears and just gave it my all. Finishing was such an amazing feeling. This race is so historic- especially after 115 years, and especially after the world record was broken although it probably will only count as a "world best" and especially after Des Davilla almost won it. I am humbled to have participated in this event. I ran in the elite's foot steps, their sweat, their tears, their pain, and their spit :) To be in an event with so many talented people was incredible. It is the "Superbowl" of marathons. 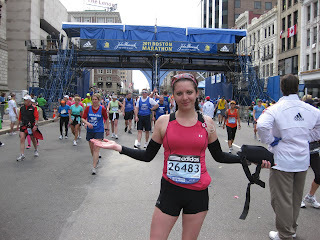 I cannot wait to BQ and run this race again as a qualifier. 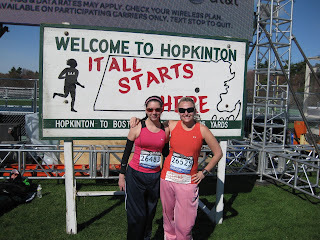 I joined a running club to train for the Chicago marathon this fall, and hope to BQ and be on the starting line of the 2013 Boston Marathon. 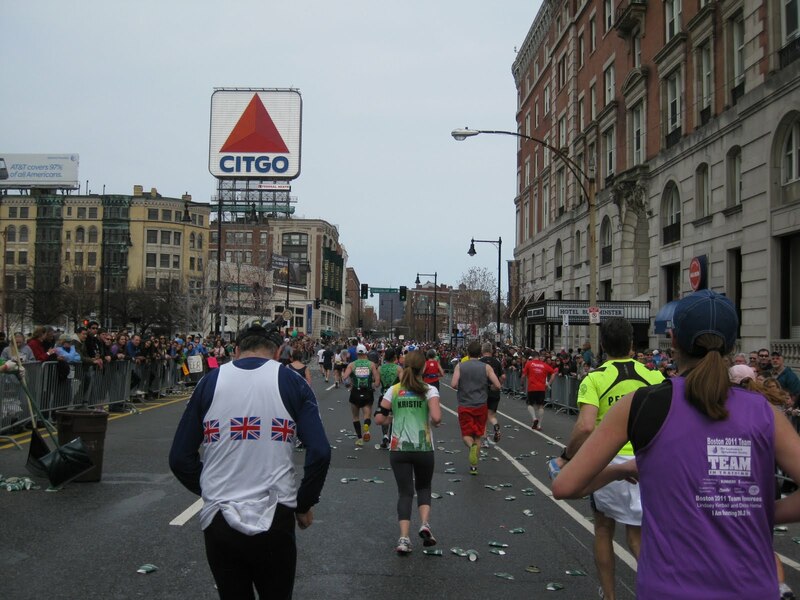 The changes in the registration for Boston will exclude Chicago as a qualifier for 2012. Had I known this beforehand, I would have chosen an earlier race to qualify with. 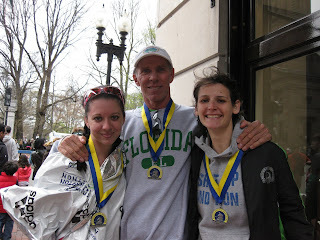 Tribu, my Dad and I post race.I think we were all happy to be finished. Daad and I post race in front of Hermes. This was an incredible experience to share with my dad.I know we will reminisce about this weekend for the rest of our lives. Thank you again SUAR for making this dream a reality! Do you ever have a "blah" day running? Did you figure out the cause? 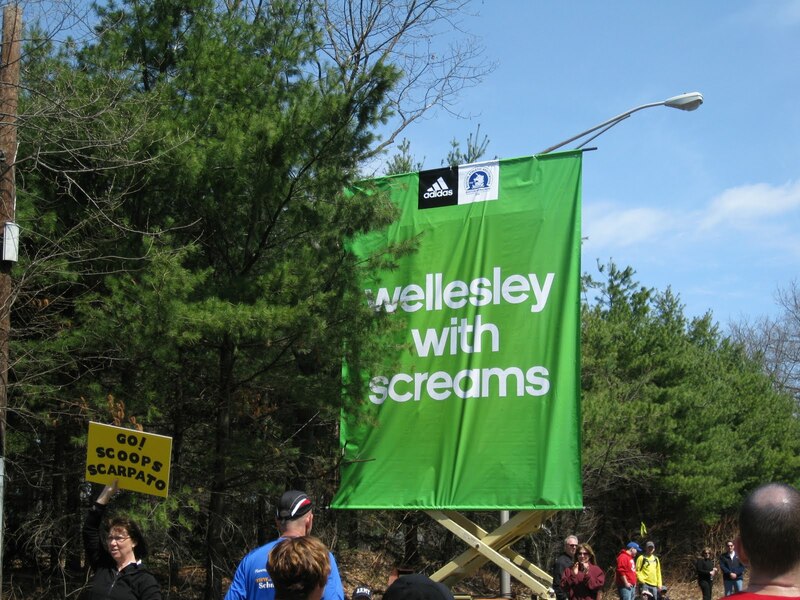 Ive never really had a bad race until this one (by all accounts it was great- no puking, peeing, pooping or walking ok, one time at a water station near the end up a small hill/stopping ok, once to get some Vaseline,but it was quick.during it and I only had one blister much to my surprise). Ive been fortunate. 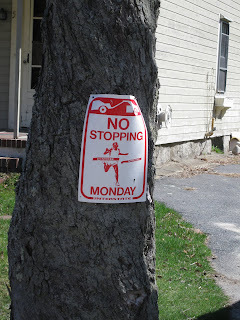 Maybe all the hype surrounding the race tired me out in the days preceding it, or maybe 9 weeks wasn't enough I felt prepared because of the quality miles logged, but I know im fully capable of running 15-20 minutes faster, and Monday just wasn't my day. Who knows? I had the same feeling after the race. I felt TERRIBLE and it was really hard to enjoy the moment when I felt like my body was shutting down. Way different than NWM. I think it must have something to do with the amount of training. Thanks for the shout out, I am really happy to have met you and hope we can keep in touch. Who knows, maybe by 2013 I will have picked up the pace and we can hang out in Athlete's village again! 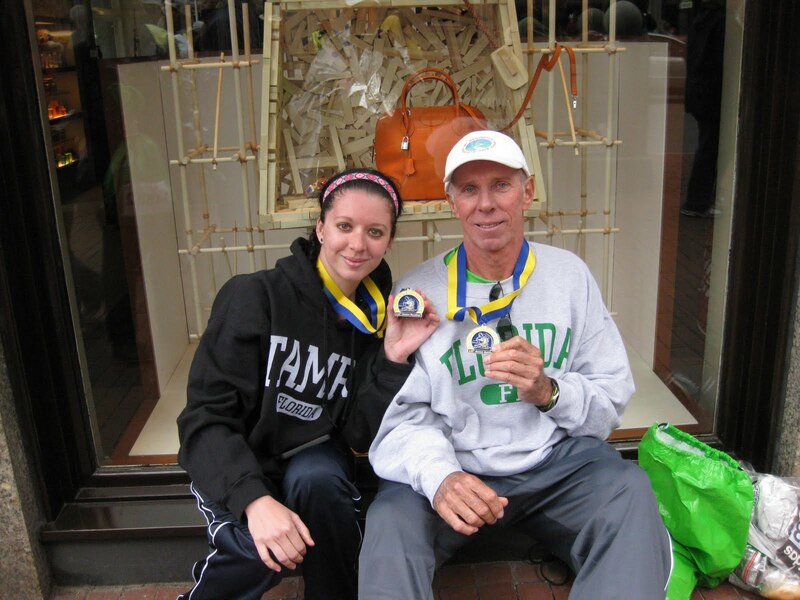 That is so awesome that you got to run Boston with your dad. Your race report is awesome. Thanks so much for sharing and letting me imagine that I had run the race! Congrats on your PR, especially given that it was kind of an off day! I feel way better after the elliptical! I am pretty sure I am going to go for a run tomorrow, I hardly hurt at all anymore except for my lower back! 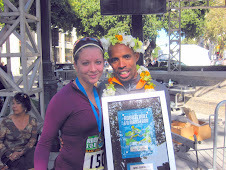 For Big Sur, you get a special jacket and medal in addition to stuff you would regularly get for finishing. I hope I get an email back confirming the entry, that would be so amazingly sweet! 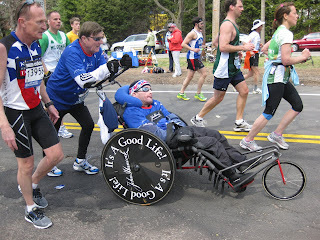 I absolutely love your blog, and the picture of Team Hoyt, wow, blow my mine, ¡ you were ther ! 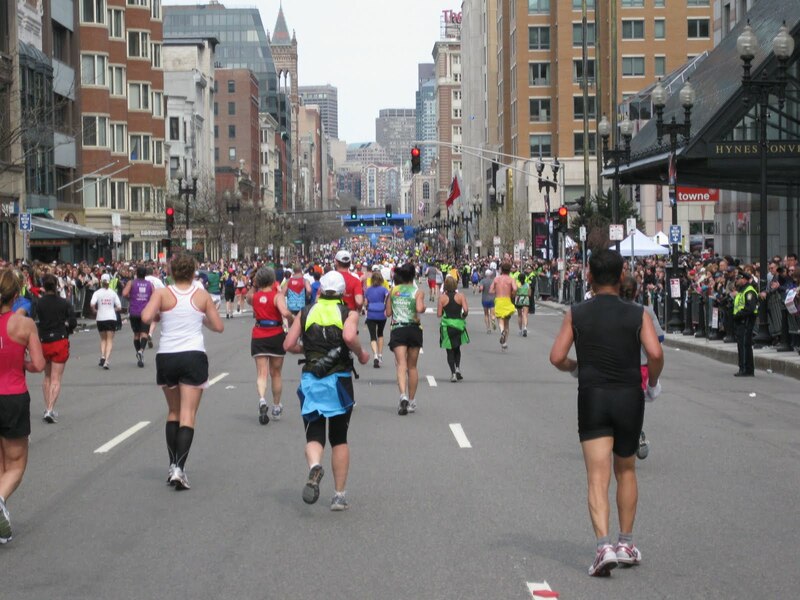 Congratulations on your Boston finish!!! 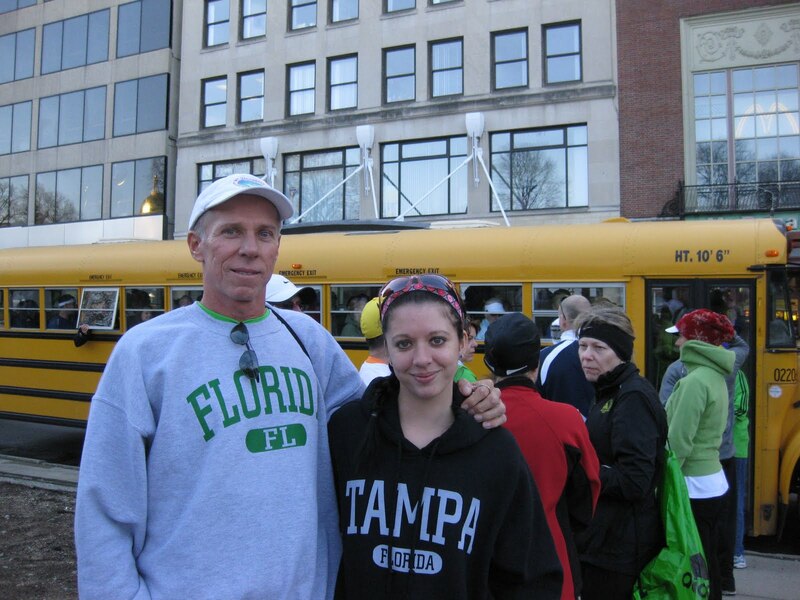 I love that you run with your dad too!!! !